A close call could have been avoided by a short plastic line. 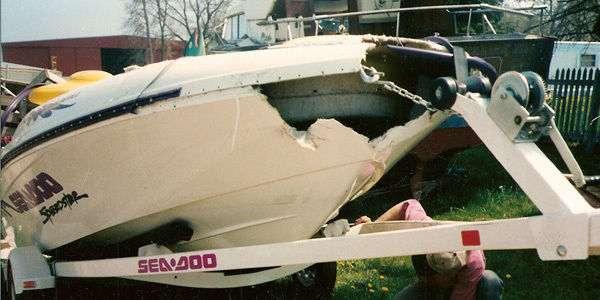 Just after the boating season got underway a few years ago, I received a call to tow a twin engine jet boat to the nearest port for repairs. When I arrived, the owner was waiting at the ramp and explained there was a slight problem. He requested I walk to the beach and look at the boat to determine how to tow it. We had to enter through private property, in an exclusive lake front area. The boat was half buried in sand lying against the base of a steel breakwall seven foot high. it presently lay. No one had observed the crash but the engines had apparently continued to run until one over heated and froze up. The other may have run out of fuel. It was fortunate the boat had not caught fire - or worse, exploded. property owner that discovered the wreck. He said when he came upon it both throttles were full open and the safety tether to the kill switch was still attached to the ignition switch. What had been reported as the need of a tow obviously was going to be a difficult salvage job. There was no access to get a crane through the private property so the wreck would have to be removed by water. It would have to be refloated, then manually pulled about 500 feet to water deep enough to take the tow, then towed backward to the nearest marina for removal. The job would be no easy task. As I pondered the various equipment needs and laid a plan of action, a nagging question stayed foremost in my mind. "What actually happened, and how did it happen?" The vessels owner did not appear to be injured but the safety tether was still on the ignition. Had any one been aboard at the time of the crash they surely would have received severe injuries or worse. It just did not add up. At the first opportunity, I got the owner aside from the onlookers and asked him what had happened. As he described an impossible scenario, the pieces began to fit together. He said the water was rough when he and a companion attempted to change drivers. A wave threw them overboard, and the boat slowly continued to run away from them. Both of them had been wearing wet suits and therefore were able to survive the hour or more in the rough, very cold water, before being rescued by a small fishing boat. at the time. I am sure the rescue was very difficult due to severe wind and waves. The persons that had been thrown into the water are lucky to be alive considering all the circumstances. able to catch it swimming after it. This statement does not fir the evidence that the boat was full throttle when it hit the breakwall miles from where the passengers were thrown into the water. At the time of this event, tethers were a fairly new item in the marine market. They were being used on PWCs, outboards jet boats and other small craft. When properly used they saved many lives. They all work the same way. The tether fastens to a specific point at the ignition on one end and the other end is attached to the operator. Any time the operator leaves the immediate control area of the watercraft; the tether pulls away from the ignition attachment and stops the engine. aboard and re-start it. If that is not possible for some unforeseen reason, they could at least hold onto the floating vessel until help arrives. A person stands a much greater chance of rescue, if injured or in need of help, it they stay with their floating boat. The bottom line is, like most safety devices, a tether can only save you if used properly. Why would you not want to use every available option to prevent disaster?